The area of the Karakum Desert is nearly 350.000 sq. km, which is about 79 per cent of Turkmenistan’s territory. The desert borders on the Ustyurt plateau in the north-west, on the Amu-Darya in the north- east, on the Murghab River oasis in the south and on the Caspian Sea in the west. The Karakum desert is divided into three parts: Low (Central), Zunguz (Northern) and Southeast. The desert is rich not only in oil and gas but other mineral resources as well. A wide range of grey mounts dominate the landscape along the boundaries of the Zunguz Karakum. Those mounts hold deposits of sulphur. From the outside they are covered with a flint crust. The landscape of the Karakum is very interesting. 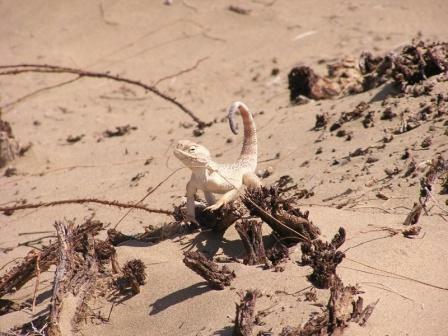 Only part of its territory is covered with sand. 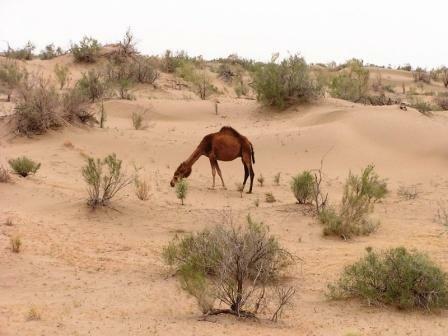 In the east there are ‘barkhans’ - mounts of loose sand of 15 to 35 m high. There are flat areas of broad expanses (takyrs) of clay soil. In contrast to sands ‘takyrs’ can keep moisture created by rains on a level of 25-30 m deep. However, in May moister reserves in the takyrs finish. So, ‘takyrs’ are called lifeless. Nothing is growing on it. The sand can keep winter moister and spring rains on the level of one meter deep. Desert acacia and poplar, white and black saksaul are growing in such areas. There are also ‘shors’, similar to above but encrusted with salt and relieved by solanaceae along their borders. A typical feature of the Karakum is a number of “old beds”, which may have been either channels of tributaries of theOxus and other rivers, or depressions which contained salt lakes. Shifting dunes offer a continually changing desert landscape. Spring in the Karakum Desert is fantastic - it doesn’t look like a desert at this time of a year. For more than two weeks it is covered with green, pink, yellow and red ‘carpets’ of different flowers - bright red poppies, gipecuum, sandy sedge, the bushes of astragalus and kandym. This desert was recorded in many ancient chronicles, Two thousand years ago Herodotus wrote about it. Desert life was quite different in those times. But some things didn’t change: up to today the desert is still the grazing ground for herds of sheep, goats and camels, and generously provides people with karakul pelts, wool, meat and camel’s milk.